Congress and President Trump gave Minnesota $6.6 million for election security. The state legislature must now authorize the Minnesota Secretary of State to use it. U.S. Department of Homeland Security urged Minnesota to take immediate action to secure our elections from bad actors. Minnesota Secretary of State Steve Simon put together a detailed plan from with support from local election officials, legislators, and cybersecurity experts. Senate Majority Leader Gazelka agreed to pass the funding. The House, on an overwhelmingly bipartisan vote, authorized using all the funds. If we don’t spend the money before the deadline, we lose it. We are already behind schedule. Despite all of this, the Minnesota Senate has not authorized using the full funds. Instead, Republican Senators have rejected all compromises and even refused to attend the latest conference committee meeting. Releasing election cybersecurity funding was supposed to be an "easy win." But Minnesotans are still waiting for the Senate to secure our election system. Our state cannot afford to lose critical funds. We must take action to defend against cyber attacks from foreign and malicious actors! It’s time for Minnesotans to take action and tell their legislators they want to defend our democracy. No more broken promises, no more missed opportunities, and no more excuses. Read up on this issue with more background information, including the truth about common excuses given for not authorizing full funding. Contact your state Senator using our Action Alert. Send a Letter to the Editor to your local newspaper. Spread the word to your community through social media and send them a link to this Action Kit. Go to a town hall to ask your Senator to vote for the full funding ASAP. Show your support at the next conference committee on Tuesday, April 23. Read below to for more information about taking each step! Let the Senate and Senate Majority Leader Gazelka know that Minnesotans want to defend our democracy and secure our elections! Catch up on developments in cybersecurity threats to states’ election systems and the path of HAVA funding in the last two legislative sessions with the Election Cybersecurity Funding background sheet, news articles and press releases. 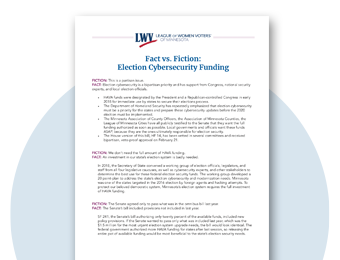 Use the Fact v. Fiction sheet to combat common misconceptions about the Election Cybersecurity Funding bill. Use our Action Alert system to take action and contact your state senator. Tell them to defend our democracy and secure our elections. Tell them to pass the full election cybersecurity funding! Use the background information above to write your own Letter to the Editor, or use one of our templates below, and submit to your local newspaper. Remember: This isn’t a partisan issue. The House Republicans have overwhelmingly supported full election security funding. Do not polarize this issue by portraying it as a partisan issue. Share this Secure Our Elections Action Kit with your friends and family on social media. Help further our impact by empowering other Minnesotans to speak about election cybersecurity funding needs. If your Senator is hosting a town hall over legislative break or before the end of the session, show up and bring friends to call for action on election cybersecurity funding. Check the newsletters and social media of your Senator to see if they are having a town hall. You can call their legislative assistant at the phone number given to ask if they are holding any events in the near future. If you brought a friend, sit yourselves in different places to increase the chances that at least one of you is called upon. Prepare your question in writing in advance. Do not ask a "Yes" or "No" question. Quickly explain the issue for the benefit of other attendees, and then ask for an explanation for why the Senate has not taken action. Example: "Why haven't the Senate conference committee members made any offers? Do they not care about the integrity of our elections?" Be assertive and demand honesty, but do not be aggressive or mean-spirited. Rudeness could turn audience members against you or the issue. If you aren’t given the chance to ask your question during the meeting, or you have additional questions, hang around afterwards. Some legislators stick around for a few extra minutes to take additional questions one-on-one. Do not accept any excuses from Republican Senators. Use our Fact vs. Fiction sheet linked above to counter any false or misleading information or excuses that Senators might give constituents. Do not allow Senators to distract the audience with other elections or funding issues. Demand that the Senator answer the question asked rather than repeat talking points. If they say they have no control over the conference committee because they aren’t on it, demand to know they’ve done to get their caucus to pressure the conference committee to make a deal. They are still ultimately responsible for getting that funding passed. If they say we don’t need the funding, ask them why they think they know better than national intelligence officials. If they say we have plenty of time to pass the funding, demand to know how the Secretary of State will get a four-year plan completed in less than four years. If they say there needs to be more questions asked or more oversight, demand to know why Senators haven’t attend conference committee hearings to ask those questions. Demand to know why they have done nothing on the issue for over a month. If they say they are trying to support local election officials and administrators, like the cities and counties, demand to know why they are not supporting the funding that the cities and counties have specifically asked for. If they say they have already voted to pass the bill, that is not the whole truth. The Senate voted to pass the bill into conference committee. It has not been passed into law. It is their job to pass the bill into law, not just let it sit in conference committee. The money is not allocated until the bill is signed into law. Show up at the next conference committee meeting to prove that you support full funding. Legislators need to know that Minnesotans think this is an important issue. The next meeting will be convened by Chair Rep. Michael Nelson (DFL - Brooklyn Park) on Tuesday, April 23rd at 1:30 pm in Room 120 of the State Capitol. Check the legislative website for updates to time or location. The committee will hear testimony from Noah Praetz, Former Director of Cook County Elections in Illinois (2013 - 2018) and an Adjunct Professor at DePaul University College of Law teaching Election Law. Praetz will testify on his experience with Cook County when the Illinois voter registration database was breached by the Russian government.